1) Candidate have to Graduate from a recognized University. 2) One year of Computer diploma. Applicants who qualify in the written test shall have to appear in computer and personality test for 50 marks for final selection on date that will be notified later on. 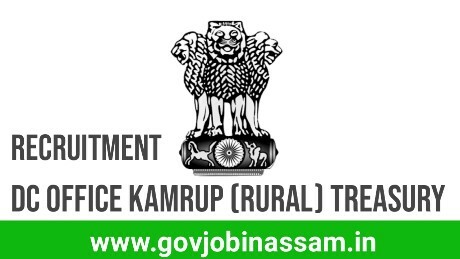 Note: The list of candidates who qualify in the written test and computer and personality test shall be hanged in the D.C’s Office, Kamrup District, Amingaon and Kamrup District Treasury, Amingaon, Guwahati-31. B) 2 (two) copies of recent passport size photograph duly attested by Gazetted Officer. C) 1 (one) self-addressed envelope of 5 cm size affixing postal stamps of Rs. 5(five) only. D) Incomplete application shall be rejected forthwith. E) No application shall be entertained after the expiry of the last date of submission. F) Copy of the registration certificate of the Employment Exchange must be enclosed along with the application form. The Deputy Commissioner, (Treasury Establishment), Kamrup, Amingaon, Guwahati- 31.